Blue, calming and naturally anti-inflammatory. Azulene, named after the Spanish word for “blue,” azul, is an organic compound; an isomer of naphthalene, the simplest polycyclic aromatic hydrocarbon (see here). Whereas naphthalene is colourless, azulene is beautifully dark blue, i really like the colour. Almost since the 15th century it is derived from the steam distillation of chamomile, blue tansy, roman chamomile or yarrow. 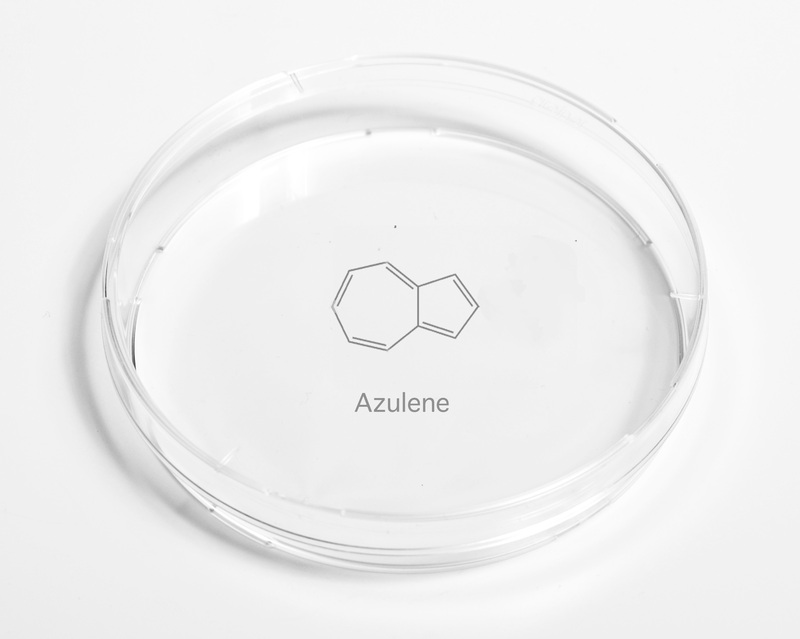 Azulene oil is a very calming ingredient and used in skincare products for sensitive, irritated skin. The fact it is calmingly blue (see this exotic azulene-coloured mushroom here) makes it a very interesting colouring compound aswell.